Trending at $7.30Trending price is based on prices over last 90 days. WE'LL MEET AGAIN - JOE LOSS VERA LYNN GLENN MILLER GEORGE FORMBY - 2 CDS - NEW!! Trending at $5.55Trending price is based on prices over last 90 days. Journey - Arrival (2001) Japan Import (SRCS-2230) ! Journey - Arrival (2001) Original Recording ! 9 product ratings - Journey - Arrival (2001) Original Recording ! 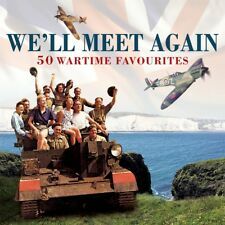 VERA LYNN-WE'LL MEET AGAIN CD (BRAND NEW)!!! This page was last updated: 24-Apr 17:30. Number of bids and bid amounts may be slightly out of date. See each listing for international shipping options and costs.